I know this departs from the usual fare, and I have no idea if this will interest any of my readers, but I figure at the very least it will be a good reference for me in the future. I’m living the low carbohydrate lifestyle and while I get along pretty well without having to resort to some of the bizarre low carb versions of normally carb-laden recipes, sometimes I still get the occasional craving for old comfort foods. Frankly, quite a few of the low carb copycat recipes just aren’t that good, and I don’t usually make them a second time after my first try. 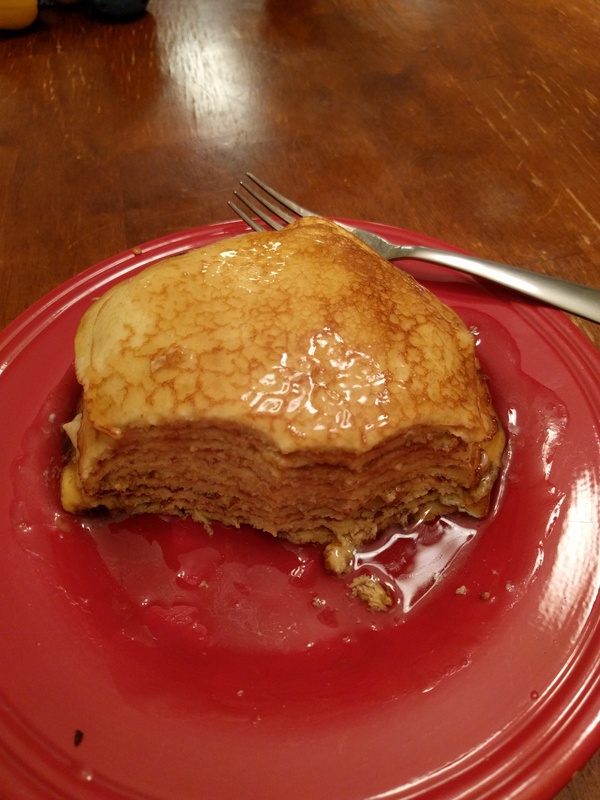 However, I tried this low carb cream cheese pancake recipe and it was one of the few that I liked at least as much as the original, if not better (by the way, that linked site has lots of good low carb recipes). The taste was great; more egg-like than a typical pancake (it’s probably more akin to a crepe to be honest). There were, however, a few issues with the recipe. The pancakes were extremely thin and flimsy, and hard to keep intact while cooking. Also, even though the pancakes were quite filling, I wished they had a bit more volume, perhaps just for the psychological effect. After a bit of experimentation, I believe I have stumbled upon a nice variation of the above recipe. The addition of a bit of baking powder fluffs up the pancakes a bit to add that volume. I also tried a bit of xanthan gum powder (not something many people have sitting in their kitchen cabinet, but useful) to help thicken the batter for cooking, and it seems to have helped a fair bit in that regard. When I cook a batch, I get many fewer torn pancakes than I did with the original recipe. They are still a bit fragile, but not nearly as much as the unmodified version. Set the cream cheese out at room temperature a few hours before cooking so that it is soft at the time of preparation. Place all of the ingredients into a blender and blend on the highest speed for 2 minutes. Let the batter rest for at least 5 minutes before cooking. Cook in an oiled skillet or griddle at medium-low heat. Pour enough batter to make 6 inch to 8 inch diameter pancakes. Flip carefully when the first side is cooked. Approx. 6 grams of carbohydrates for the entire batch. Here are a few tips for cooking these pancakes. It’s important to use a nicely prepared non-stick cooking surface, as these pancakes are a bit fragile. I use a well-seasoned cast iron skillet, although I imagine other types of non-stick pans would work as well. I prefer cast iron, for its heat storage properties and because I can use my favorite weapon of choice, instead of a plastic spatula. The key is to keep the heat nice and low so that the pancakes can cook slowly. Let most of the cooking be done on the first side so that the pancake will stay intact when you flip it. It will probably take a few tries to get it right, so don’t be surprised if your first few pancakes get mangled. Even if you aren’t eating low carb, if you would like a more savory breakfast pancake, give this one a try. It’s a hell of a lot healthier than pancakes composed of white flour and sugary syrup! Heh, pretty much. I guess that’s why it reminded me more of a crepe than a pancake.